1 of 1 Place roasted red peppers, almonds, olive oil, vinegar, garlic, salt and pepper in a blender. Blend until smooth. Cover and refrigerate until serving. 1 of 3 Heat a gas grill to medium-high or a charcoal grill to medium-hot. Lightly grease grill rack. 2 of 3 In a large bowl, toss vegetables with olive oil and season with salt and pepper. 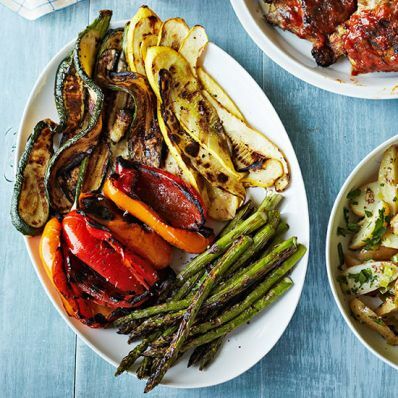 Grill vegetables about 4 to 5 minutes per side, turning as needed to avoid burning. 3 of 3 Serve warm or at room temperature with romesco sauce on the side. Per Serving: 197 kcal cal., 381 mg sodium, 5 g fiber, 4 g pro., 2 g sat. fat, 13 g carb., 15 g Fat, total, 0 mg chol.